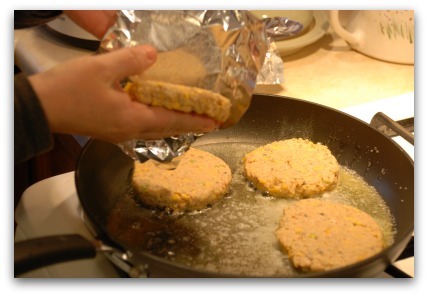 Crispy salmon cakes recipe that's low carb? Yep! Gluten free too! This salmon cakes recipe was born from necessity. I was going to make my favorite Salmon Loaf but I was short an egg. So I decided to go with the flow. 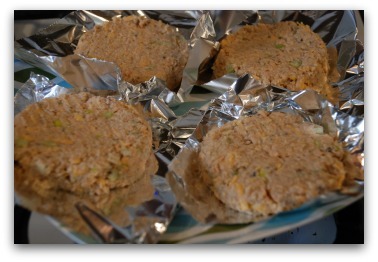 Perhaps it was possible to make low carb salmon fish cakes that would be very crispy on the outside yet still moist on the inside. Well, I do believe I nailed it. I kept the recipe as simple as possible, letting the salmon take all the glory. I was not disappointed. These are absolutely delicious, gluten free and work perfectly well in a low carb / keto lifestyle. I served mine with a side of buttery asparagus. So delicious!! Place the almond flour in a large bowl and soak in the almond milk for a few minutes. Add and mash the salmon to crush the bones, adding the reserved juice from one of the tins. Stir in the celery, lemon rind, the egg, the cheese and the salt and pepper. Mix very well until completely combined. Fill a scant 1/2 of a one cup dry measure with the mixture, packing it down firmly. You want to end up with 8 cakes in total. Turn over onto a piece of parchment paper or aluminum foil. Use the back of a fork to pat down a little. Repeat with the remaining mixture. Place in the fridge for about an hour to allow the cakes to firm up. If you don't, the cakes may fall apart when you go to flip them. Heat butter and avocado oil in a large non-stick pan. Gently turn the cakes from the parchment paper onto your hand and gently place the cakes, one at a time into the heated fats. Fry 10-12 minutes on each side over medium heat. 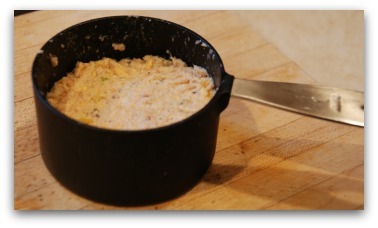 Serve with homemade tartar sauce or lemon juice. Mix 2 tbsp mayonnaise with 2 tsp sugar free green relish. If you don't have relish, chop 1/8 cup of sugar free Bread and Butter Chips instead. 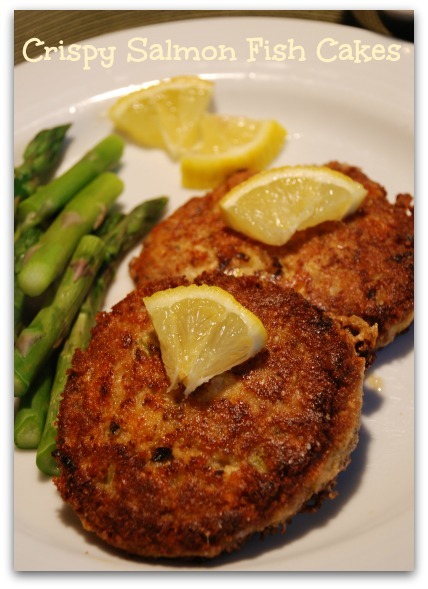 Let's go from this salmon cakes recipe page back to the Home page!